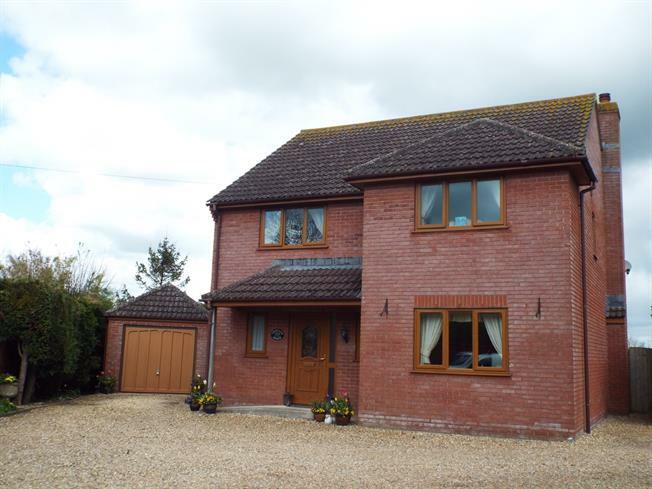 4 Bedroom Detached House For Sale in Castle Cary for Asking Price £465,000. Orchard House is an imposing, executive home situated within a desirable area of Castle Cary, offering excellent far reaching countryside views. The property is initially entered into a welcoming entrance hall which in turn provides access to the ground floor accommodation, which comprises: a light and airy Living room, a spacious Dining room, WC, Kitchen/breakfast room and Utility room. To the first floor there are: four bedrooms (with the master benefitting from an ensuite) and a family Bathroom. The property enjoys a well kept, sunny aspect rear Garden, with magnificent views, as well as the added practical benefits of a Garage, large driveway providing ample parking for several vehicles and double glazing throughout. Entered via part glazed wooden door, with doors to WC, Kitchen, Living room and Dining room respectively. A light and airy Living room with a feature fireplace and French doors opening out onto a seating area in the rear Garden, perfect for alfresco dining. With double doors accessing the Dining room. Fitted with base units with work surfaces over, stainless steel sink and drainer and space and plumbing for washing machine. With side door to outside. A spacious Dining room with double glazed window to front and radiator. Low level WC, wall hung wash hand basin and radiator. Spacious area with airing cupboard and doors to all Bedrooms and Bathroom respectively. Suite comprising walk in shower, pedestal wash hand basin and low level WC. With obscured window to side. Large double room with double glazed window to front and radiator. Double room with double glazed window to front and radiator. Double room with built in wardrobe, wardrobe and double glazed window to rear overlooking the countryside. Suite comprising panelled bath, pedestal wash hand basin and low level WC. With obscured window to side. A vast driveway providing ample parking for several vehicles, a single Garage and side access to rear Garden. A particularly noteworthy, sunny aspect rear Garden that offers far reaching countryside views. A patio seating area offering a perfect alfresco dining and entertaining setting sits immediately to the rear of the property, with a large section laid to lawn, and an area at the foot of the Garden, where two greenhouses sit. The Garden is enclosed by neat hedging and timber fencing.